Are you putting your hand over your mouth when you smile? Not anymore! Your dentist can offer you cosmetic dentistry that will transform your life. Problem- How can I whiten my yellow teeth? Our teeth will get darker with age. For older people, their teeth will naturally turn a brownish yellow—not necessarily from smoking, coffee, or wine. Teeth Whitening will lightens teeth that have been stained or discolored by age, food, drink, and smoking. This is a non-invasive procedure, which leaves you with a natural yet bright smile. Old black fillings can be replace with tooth-coloured fillings that blend in with the surrounding tooth structure for a natural appearance. White fillings chemically bond to your tooth structure, giving further support to your tooth. Problem- Are you embarrassed by your broken or chipped teeth? Veneers are thin custom-made, tooth-colored shells that are bonded onto your teeth. 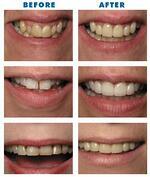 Veneers are a very versatile treatment, providing a brighter, whiter, straighter smile for almost anyone. Problem- Can my broken tooth be saved? Yes, your dentist might be able to save your tooth by placing a crown on the broken tooth. A crown is a tooth-colored, custom-made covering that encases the entire tooth surface restoring it to its original shape and size. Crowns protect and strengthen teeth that cannot be restored with fillings or other types of restorations. Modern-day dentures can look very realistic and improve the appearance of your face but as your gums shrink and your bite changes your dentures may need to be relined or re-made. Crooked teeth might affect your in confidence and self-esteem. If left untreated, crooked teeth can lead to periodontal disease and premature wear on your enamel. You can choose from Envisaging, which are clear braces to incognito braces that are applied to your teeth in the inside. It might be easier to smile with confidence. A beautiful smile is no longer just for celebrities.20/20 Dental Practice is cosmetic dentist Newbury.